Heavenly blog! : No. 704: Christian People's Campaign and warning against ugjenfødte homosexuality , abortion, etc. are unbiblical and against God's word! No. 704: Christian People's Campaign and warning against ugjenfødte homosexuality , abortion, etc. are unbiblical and against God's word! Christian People's Campaign and warning against ugjenfødte homosexuality , abortion, etc. are unbiblical and against God's word! 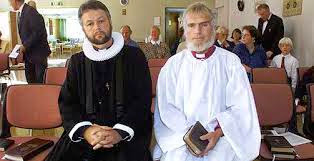 Borre Knudsen , Ludvig Nessa and other abortion opponents have run a questionable activities and direct unbiblical view it is meant to be a biblical and New Testament activities. Tragically, there are so few believers do not realize this. But afterwards they have warned the world's children to repent, then " forgets " the primers and their main task, to exhort the faithful to a holy and given life in accordance with God's word and God 's will. Photo of the extreme and seduced Ludvig Nessa and Borre Knudsen . We will not warn the unsaved receive special type of sins up and thought . But what should we do to those who profess the name of Jesus . But here turns one at the head. 1 Cor. 5 9 I wrote in the letter to you that you should not have anything to do with people living in adultery . 10 I did not mean everyone in this world immoral or greedy, or are robbers and idolaters . Then must ye needs go out of the world . 11 What I meant by what I wrote was that you are not to keep one called brother , and yet sexually immoral or greedy , or is an idolater , projectors , drunkard , or robber . These shall ye not eat with . 12 What have I to do with judging outsiders ? Is it not those inside , you should judge? 13 Those who are outside , God judges . Get when the evil away from you ! We create confusion , destroying the Christian message and the Christian remain babes in Christ through preaching today ! What should we preach ? We must know who we are to preach , and what to preach to them. To those non believers we preach one thing only , that sin is not believing in Jesus. But for those who are believers , we will stadigvek preach against sin , admonish and advise when we will stadigvek put off the old man and put on the new ! We have lost a total understanding of our mission and the biblical standard for the church of God ! It is not the non-believers we should admonish , but the believers who turn aside from the Lord's way . But here turns one at the head. Finally, let me take five points that are important and vital to our understanding of this topic and the importance of living as a New Testament believer. 1 ) The unbelievers are and remain sinners if they live out their sin or live as cultured people. 2 ) All those who have accepted Jesus are God's children . 3 ) A believer can lose his salvation if one lives in sin and not get it to light. 4 ) We will not admonish the world , but other believers who turn aside from the way of the Lord whether in life and learning . 5 ) Believers who will not repent shall be supported out of the church . Believers people today here in Norway are so misled , deceived and out of spiritual courses that they must repent, just as the world's children need . But there is light in the tunnel for you ! Read up on our blog and website and support us in prayer and financially !